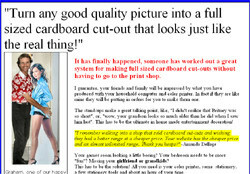 Blurb: A software and e-book package to make lifesized cardboard cutouts. -Tells you how to find the perfect image. -Prepare the image in minutes. -The most suitable paper and materials to use. -The best methods for putting it together. -and many more fantastic tips, tricks and ideas.